More Liam Neeson late-middle age macho movie madness, this time on a plane. This review was written 1 year too late. I don’t know why Liam Neeson suddenly started making one action movie after another about eight or nine years ago but I am glad he did. 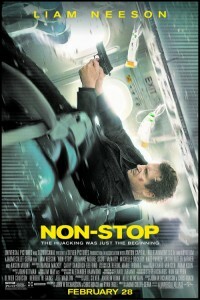 His ageing, world-weary agents/marshals/hunters/crooks generally forced into situations not of their doing have proved enjoyable fare, and “Non-Stop” is another addition. Directed by Jaume Collet-Serra, who was also behind the camera for Neeson’s “Unknown” and his recent “Run All Night”, “Non-Stop” moves the action to the skies. 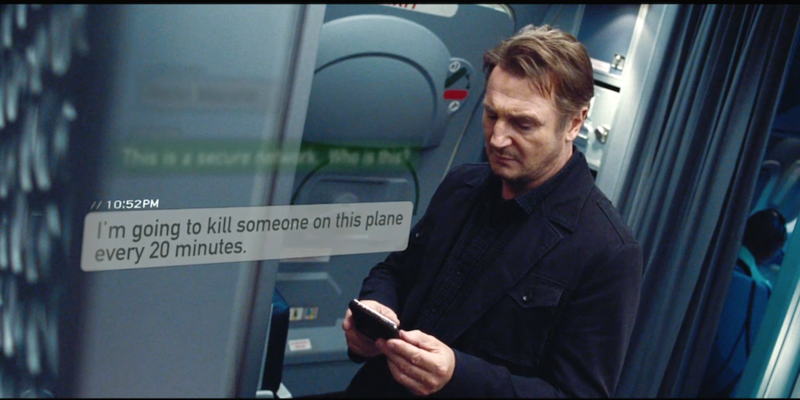 Neeson is Air Marshal Bill Marks who receives a mid-air text threat that people on the plane are going to start dying every 20 minutes unless a few quid (well, $150m) is transferred to a secret bank account. And yes, after 20 minutes, someone does indeed snuff it. And there we have our setup, ladies and gentlemen. All that remains for Liam is to dive into the mystery of who is doing what, why, stop the plane being down, and clear his name after being framed for everything. Oh, and not have a drink either since he has a bit of a booze problem. He’s assisted by Julianne Moore, who, frankly doesn’t have a lot to do but pick up her cheque and good luck to her for that. Liam, meanwhile, kicks some passenger arse when they start to think he’s behind the whole thing, discovers a bomb and some poison darts (poison darts! ), and generally does a lot of his trademark growing at folk as he seeks to keep control of an increasingly unstable situation. It’s enjoyable, by-the-numbers stuff. The plane, like all planes in airborne thrillers, seems to be Tardis-like in its size, providing endless repositories for dead people, nervous people, tied-up people, and all manner of things. A Ryanair 737, this ain’t. But, like Ireland’s much maligned airline, “Non-Stop” gets you there on time, is not entirely unpleasant, and you know what you’re getting. And, like Ryanair, it made money: $200m+ off a $50m budget, so it must have something to pack the punters in.